Timex, one of the leading watch makers in India, announced the lucky winners of the Timex Howzatt offer. 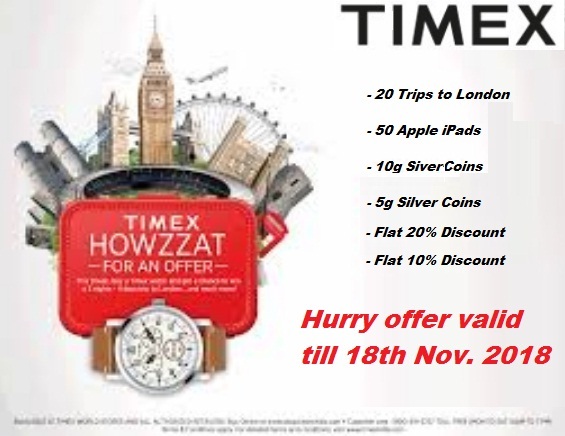 Timex is taking 20 lucky winners of Diwali Howzatt offer for a free trip to London in 2019. To top it all, many customers also won other compelling prizes like iPad, silver coins and attractive discount on watches. 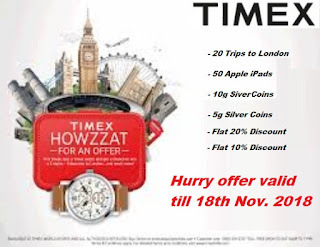 With the onset of festive season, Timex announced the Howzatt offer in India between 10th October 2018 to 15th November 2018 through a massive advertising campaign. The campaign excited Timex customers to not only own a watch from the global brand but also win exciting prizes. Under the offer customers who bought any 'Timex' or 'Helix' brand watch from www.shop.timexindia.com or from any authorized retailer, got a golden opportunity to win an assured prize by scratching a card and win exciting prizes like Trip to London, Ipads, Silver Coins or discount. The company ran the Howzatt offer scratch card promotion PAN India (except the state of Tamil Nadu, Puducherry and wherever prohibited by Law).